There is little that works about “Cocote,” the Dominican Republic’s submission to the 91st Academy Awards. The most obvious shortfall is how the film is technically assembled. It begins in letterbox (full screen) format, which in itself is not that uncommon, Jonah Hill’s “Mid 90’s” and Poland’s foreign entry “Cold War” both utilize the format. However, writer/director Nelson Carlo de Los Santos Arias switches back and forth between full screen and widescreen, color and black and white. The purpose of this back and forth is unapparent and the result is jarring each time. “Cocote” is presented in a way that makes it difficult for the viewer to understand time, place, and to differentiate between religions and practices. A more experienced filmmaker could have made the narrative clearer. Alberto (Santos) left his hometown for life and work in the city. He is a gardener for a wealthy family who allows him time off after receiving the news that his father has passed away. Upon his arrival home, he learns that his family already did the burial and that his father was cursed. “He has black matter around him,” his sisters explain. He’s horrified to learn that his father was killed, beheaded in a clash between religions. Alberto’s evangelical faith puts him at odds with locals who want to perform 9 days of rituals after the burial. Alberto spends his visit home, not in mourning, but desperately trying to understand this cult-like behavior that has the locals convinced a chicken is speaking God’s word or a goat can go bar hopping. You can almost admire Arias experimental nature, some of the scenes are aesthetically pleasing to look at and it’s obvious he and cinematographer Roman Kasseroller know how to frame a scene. It’s how they jolt us back and forth visually that ruins the technique. 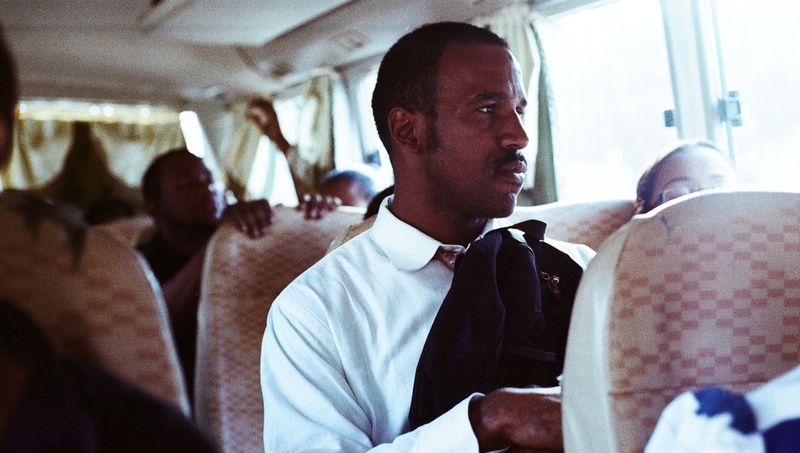 There are sequences in “Cocote,” for instance the bus ride from the city, where the framing and use of natural light is extraordinary, with vivid colors passing behind the shadowed faces. Then the scene is ruined by the use of slow motion. Another technique that becomes notably overused is the 360-degree spinning camera where the viewer can see everything that is happening around a scene. “Cocote” leaves the viewer in the dark for much of the story, it’s either shouting matches with a character we cannot place or and an endless array of mourning songs or musical sermons that have attendees dancing the devil away. A documentary-style approach to the editing, combined with the roller coaster aspect ratio changes makes the full-screen moments look and feel like found footage. We never come to understand any of the characters, no one, not even Albert. He’s rarely on screen for very long, and I think we are supposed to assume much of the camera wandering moments are from his point of view, but that isn’t clear. “Cocote” incoherence leaves the viewer searching in vain for any opportunity to engage with the material. An incoherent mess from a new filmmaker that doesn’t seem to understand that you need to pick one style instead of throwing them all together.